There was only a single repeat winner from last year’s team, Tamari Davis in the 200. In AOY balloting dominated by non-seniors, look for a host of repeat No. 1s next year. Davis will be going for 3 in a row and she and Ewert will be joined as potential repeaters by Briana Williams (100), Tuohy (mile & 2M), Tia Jones (100H), Brooke Jaworski (400H), Shelby Tyler (HJ), Julia Fixsen (PV), Jasmine Moore (TJ) & Anna Hall (heptathlon). Athletes scoring in more than one event: Williams, Davis & Abby Steiner (100/200), Arria Minor (200/400), Sterling Lester (400/hept), Caitlin Collier (800/mile), Tuohy (mile/2M), Emily Sloan (100H/300H), Ewert (walks/steeple), Anna Hall (HJ/hept), Jasmine Moore (LJ/TJ), Veronica Fraley (SP/DT) & Shelby Moran (DT/HT). CO-NATIONAL LEADERS Williams & Davis were clearly the top 2, their 11.13s giving them a share of No. 4 on the all-time list. Running at opposite ends of Florida, they met just once, with Williams prevailing in the State-3A final, 11.31–11.36 in the battle for No. 1. 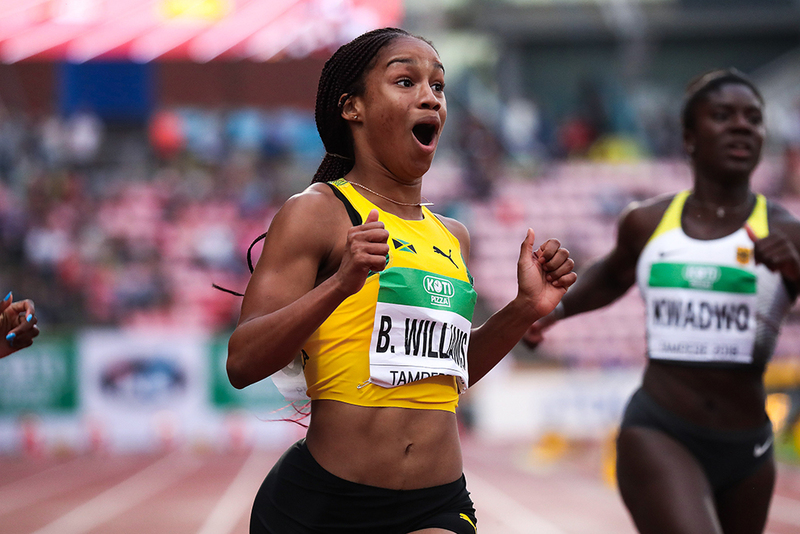 Representing Jamaica, Williams went on to win World Junior gold. Davis set a new national age-15 record with her time, but that too-young age also kept her out of the Juniors… Flannel was closest to Davis at NBN, but at 11.19 and 11.41, not very close… Davies was the first prep at the USATF Junior and repeats as No. 4… Steiner was undefeated and had 5 times under 11.60 but never faced serious competition… Honorable mention to 11.12w performer Sha’Carri Richardson (Carter, Dallas, Texas)… A senior hasn’t been No. 1 here since ’12 (Shayla Sanders). AS IN THE 100, Williams & Davis were clearly the toppers. And, just like the 100 they met just once, at State, but this time Davis handily prevailed, 22.48–23.15, for another national age-15 record and No. 3 on the all-time list. A repeat winner from last year, Davis has a shot at an amazing 5 No. 1s in the event… Williams ran 22.50 to win World Junior gold and capture No. 5 on the all-time list… The undefeated Steiner’s 22.73 to win State earned her the No. 7 position ever… Davies was undefeated and made the Junior final but did not run… Minor was undefeated but never competed out of state… Honorable Mention to Kynnedy Flannel (Alvin, Texas), last year’s No. 4. HOLMES RAN ONLY twice outdoors, but she won both, including a stunning 51.21 win at New Balance to move to No. 7 on the all-time list. She’s the first Connecticuter ever to lead here… GSW champ Minor lost at State as part of a 3-sprint meet but repeated as No. 2… Harris was 2nd to Holmes at New Balance, with the final spots going to Brooks and Arcadia winners Ford and Lester. FLORIDA’S FIRST 800 No. 1 ever, Collier was undefeated by preps in moving up a spot from last year. Her season-leading mark gave her No. 4 on the all-time list. Overall, she had the year’s 4 fastest times… New Balance winner Mu was undefeated and finished off with the AAUJO title… McIntosh won Brooks and was also undefeated… State champs Vanrield and Friborg round things out. IN THE FIRST of a pair of No. 1s, our AOY went undefeated in moving up from No. 4 last year. Tuohy’s 4:33.87 NBN win rates as the fastest outdoor mile ever (there are 3 faster indoor marks, 2 by Mary Cain and 1 by Alexa Efraimson). She also won her State 1500 in 4:14.45 to move to No. 8 on that all-time list… Dream Mile winner Collier was also the first prep at the Juniors… Castillo had a pair of notable wins to rate ahead of adidas runner-up Culbreath… Wilkinson had only a single outdoor race, but gains the final spot on the basis of a stellar indoor campaign. TUOHY STAMPED her name on the all-time lists here too, putting up the Nos. 5, 7 & 8 times ever in the 3000 and No. 2 in the 8-lapper… Hart and Noe scored on the ATL as well, claiming all-time-performer spots 9 and 7. They traded wins at Arcadia and Brooks, Hart having a better overall record. 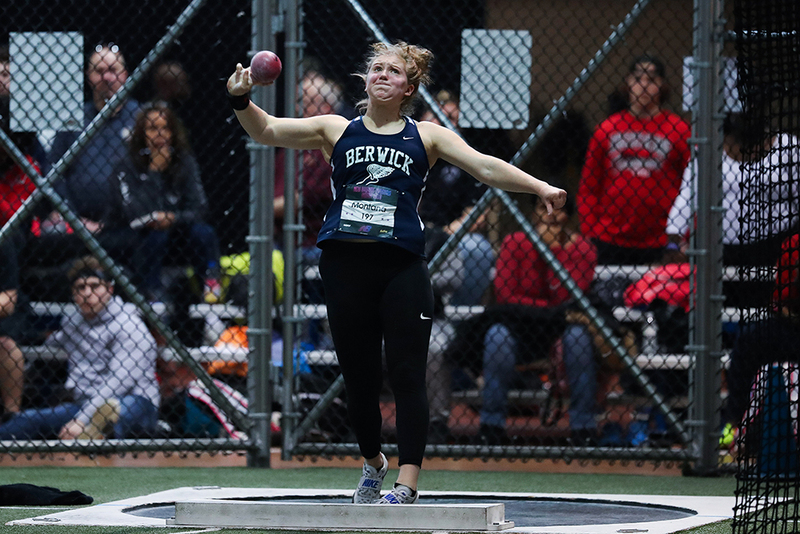 Denner won a pair of invitationals… Honorable Mention to Kelsey Chmiel (Saratoga Springs, New York)… Canadian Taryn O’Neill won the big Brooks race. AFTER 3 STRAIGHT YEARS as No. 2, Jones finally gets the top spot, making her the fifth ever to rate 4 times. Next year she seeks to become the first 5-timer. The AOY runner-up was undefeated and went on to win World Junior gold. Her amazing 12.84 as a frosh remains the national record, but she missed that by just 0.05 this year. The World Junior gold medalist, she produced the year’s 5 fastest times… The winner of a pair of major invites, Stark moved to No. 11 on the all-time list… Sloan won a trio of biggies, but lost to Stark (who has already started her senior year as Youth Olympic Games gold medalist) at NBN. IT WAS CLOSE between list leaders Jaworski (400H) and Russell (300H). The Juniors, where they were the first two preps, provided the decider in the Wisconsite’s favor… Arcadia 300H winner Russell moved to No. 3 on the all-time list… Watson was next at the Juniors and gets No. 3… Sloan lost only to Russell at Arcadia… After 4 years as No. 1, national recordholder Sydney McLaughlin was conspicuous in her absence. WALKING’S record machine set new national standards in the mile (6:45.68), 3000 (13:31.79), 5000 (22:38.16), 5K (23:08) and 10,000 (49:07.52 & 45:57.81). She also found time to put up the fastest 2000 steeple time of the year, 6:38.79, in winning New Balance, and ran 10:38.85 to take 3rd in the Ohio State 2M. VIRGINIA RIVALS Western Branch and Nansemond River didn’t meet at State, but were 1-2 at New Balance with the fastest times in the nation to make their state the only one other than California or Texas to rank 1–2. Western Branch’s list leader by Na’Tajah Ballard, Adriana Shockley, Jazmine Tilmon & Jessica Tucker made it just the eighth school ever to break 45… DeSoto and Buford were undefeated with the Texans having a deeper set of times… Last year’s No. 1 Bullis rounds things out. THE BULLIS FOURSOME of Shaniya Hall, Leah Phillips, Ashley Seymour & Masai Russell set a national indoor record of 1:34.75 to win the New Balance Indoor. Nobody could top that outdoors (busy Bullis ran just 1:36.18) and the Marylanders rate as the No. 7 team ever on the absolute list… Duncanville became the No. 9 team ever with the year’s fastest outdoor clocking. 4 OF LAST YEAR’S 5 rankers made it back, with DeSoto becoming the first successful defender since New York’s Cardozo in ’10… DeSoto (team of Jalese Moore, Cierra Wash, Zariah Jones & Bryannia Murphy) and Duncanville went 1-2 at Texas-6A with the two fastest outdoor times in the nation, but indoor watch leader Bullis won Arcadia and was the first U.S. squad at Penn to slip into the runner-up position, up a place from last year… The best Florida foursomes didn’t get together at State but did at the Florida Relays with American Heritage winning by 0.40 to claim No. 4. PENNSYLVANIA SCORES its first No. 1 ever as State champ Neumann Goretti (Sydni Townsend, Mykala Perry, Dasia Wilson, KamiJoi Hickson) went on to win the crucial NBN title… Lincoln was close behind the Philadelphians at NBN… For the No. 3 position, Shenendehowa was the the No. 2 U.S. team behind Neumann Goretti at Penn and 4 seconds faster than Kings… West won a second-tier race at New Balance but had the fourth-fastest time in the nation. IT’S A DEBUT on the girls side as a ranking event for the longest relay, with Great Oak (Sandra Pflughoft, Arianna Griffiths, Fatima Cortes & Tori Gaitan) being miles ahead of the rest with the year’s 2 fastest times, both some 15 seconds faster than the rest of the contenders. NOT USUALLY a major player in this event, the Lone Star State put up a pair of rankers for the first time ever and also got its first winner as North won the Texas Relays with fastest time in the nation, courtesy of Brooke Givens, Elon’a Jones, Jania Martin & London Culbreath)… Oak Park repeats as No. 2 after capturing New Balance with the second-fastest time in the nation… Cypress Springs followed North across the line at the Texas Relays. OAK RIDGE, with Denner twins Elena & Maddy bracketing Chloe Taylor & Abby Fletcher, won Arcadia in a list-leading 11:42.85… North Rockland rates for the fourth year in a row on the strength of a New Balance Indoor win. A THRILLING head-to-head NBN battle between Western Branch and Bullis (Potomac, Maryland) found both schools breaking the former national record, with the former’s foursome of Shadajah Ballard, Jazmine Tilmon, Adriana Shockley & Na’ Taja Ballard claiming the new standard at 54.67. That’s an average of 13.668 per leg. TYLER HIT a “daily double” by winning the USATF Junior and then the next day taking the New Balance title. 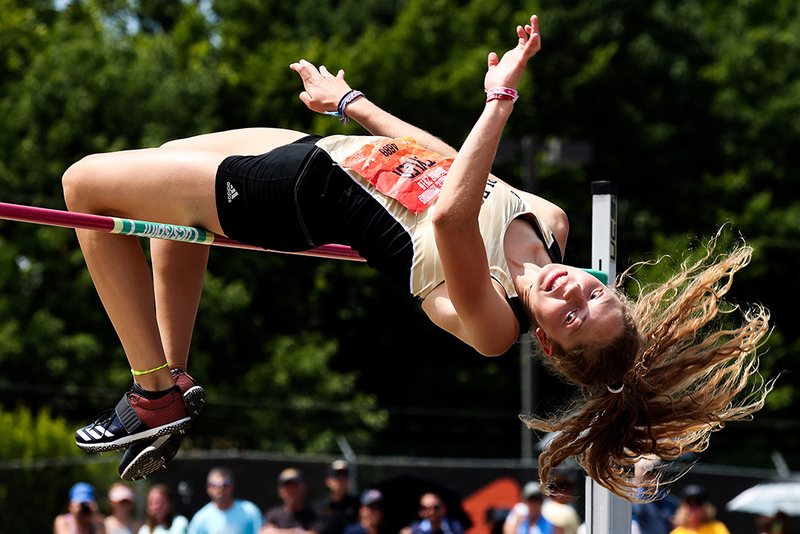 She ended her season with an 11th at the World Juniors… The second-rated Hall did most of her big jumping as part of heptathlons, where she rates No. 1… Barnes was the second prep at the Juniors and moves up a spot from last year… List leader Isenbarger ends up in the No. 5 position after losing State to Tyler and claiming only 5th at the Juniors. FIXSEN WAS undefeated by preps and solidified the top spot by being the first high schoolers at the Juniors. The first Minnesotan ever to rate No. 1 here, she went on to tie for 7th at the World Juniors… Cunliffe, Campbell & Hayward shared the yearly outdoor list lead with their 14-footers, and also a share of No. 9 on the all-time list. Cunliffe went on to win the USATFJO title… Campbell and Hayward both PRed at the Texas Relays with Campbell winning on misses. 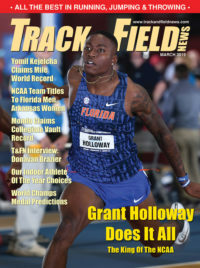 Campbell had 9 meets over 13-0 to Hayward’s 6… Ellis didn’t vault outdoors, but indoors had the year’s highest clearance, a 14-1¼ that makes her No. 8 ever, indoors and out… Honorable Mention to Alana Carroll (Averill Park, New York), the Penn and New Balance winner. THOMAS’S OUTDOOR season was cut short, but she had enough big marks indoors to take No. 1. Her list-leader wasn’t a PR, but only 4 other jumpers have ever gone farther. She moves up a spot from last year. Her only loss was to Canadian Tatiana Aholou at the New Balance Indoor… Triple jump No. 1 Moore was undefeated by preps outdoors… Rating for the third straight year (No. 4 as a soph, No. 5 as a junior), Evans was also undefeated. GETTING BETTER every year, Moore ascended to the top spot after being No. 3 as a frosh and No. 2 as a soph. She’s now poised to be just the third 4-timer ever. Undefeated by preps, Moore moved to No. 3 on the all-time list… Ellis takes the second slot after beating Fisher twice… Marsh never lost to a prep in repeating as No. 4. WITH THE YEAR’S longest throw and being undefeated outdoors Montana is an easy choice. She becomes the first Pennsylvania leader since Elaine Sobansky in ’80… Bigsby, Whitted & Fraley were 2-3-4 at New Balance and follow in that order here. Bigsby was the nation’s only indoor 50-footer. FRALEY SUFFERED only a single loss, her 3rd at Iron Wood behind Kelby and Moran and that wasn’t enough to keep her out of the top spot… List leader Moran lost to Kelby at the Juniors but had a superior overall record plus the Iron Wood win… Kelby won the Arcadia title over Cali champ Grotegeer… With wins over Moran and Kelby at the Juniors, Freeman grabs the final spot. SPREADING THE WEALTH, Moran and Kunza became the first hammer rankers ever from their states. Moran moved to No. 3 all-time and Kunza to No. 8. won Iron Wood and was first prep at USATF Junior. Moran was undefeated by preps. RATED IN THE 2–3 positions last year, Baker and Ciccolini each moved up a spot… Baker, who went on to win World Junior bronze, was undefeated by preps and moved to No. 3 on the all-time list, producing all-time performances 4, 5 & 9… Ciccolini’s only prep loss was to Baker, while Smith’s only loss was to Ciccolini…. Juszczyk is just the third frosh (after Hannah Carson and Haley Crouser) ever to earn a spot. THE ALL-TIME LIST now belongs to Hall, who rang up the three highest totals ever. In addition to her altitude-aided national record of 5798 at Great Southwest, she also claimed the low-altitude record with her 5660 at the Juniors… Lester’s runner-up mark at the Juniors moved her to No. 8 all-time as she moved up a spot from last year. This is Lester’s last year of prep competition as she will graduate early and be a collegian in ’19. Juškevičiūtė was the national Junior champion of Lithuania. This year’s Girls A-A team is the 38th we have chosen. Most events are rated 5‑deep, but those contested less frequently may have fewer entries, or just a special-recognition notation. To see teams from all the previous years, go here. As with our annual World/U.S. Rankings, winning major meets and beating prime opponents was far more important than simply placing high on the yearly lists. As always, our A-A compilers placed prime emphasis on invitational meets which occurred after the close of the regular prep season—New Balance Nationals (NBN), Golden South (GS), Great Southwest (GSW), Midwest Distance Classic (MWDC), the Midwest Meet of Champions (MWMOC), adidas Dream, and Brooks PR—as well as the USATF Junior Championships. Evidencing our strong desire to have the A-A compilations represent actual high school competition as much as possible, we consider the “real” season to be over as of the USATF Juniors. Marks from Junior Olympic and summer Youth/Junior competitions appear on our lists, but those age-group meets are not considered as major honors. Indoor meets are considered in the ratings, but given far less weight than outdoors. The most important undercover competitions are the New Balance Indoor Nationals, the Simplot Invitational and the Pole Vault Summit. Abbreviations: i = mark made indoors; (A) = altitude over 1000m (in affected events only); # = was an A-A member in ’17; @ = was an A-A member in ’16; % was an A-A member in ’15. Class data: *=junior; **=soph; ***=frosh; all others are seniors.